Where are all you SC nurses? Hello; I'm a Rn here in the upstate of S.C. I graduated in 2003 with my nursing degree at the ripe 'ol age of 42, just a few months shy of my 43rd birthday! Outside of miltary bootcamp when I was barely 19, attaining my nurse's degree was by far the most challenging, but the most rewarding that I've experienced in my life thus far.....and I'm now just a few months away from becoming 50! I wasn't the "typical" college student, to say the least. Hahaha! When I first seriously considered becoming a nurse, I knew instinctively that it wouldn't be an easy or cheap goal to undertake and achieve. I wanted to 'test the water' so to speak to see for myself if I thought that it was something that I could really do; so, I went to Tri-County Tech taking the night courses required to get my CNA certification to work as a nurse's assistant. I worked during the day and went to the night classes too durning the week and studied in all of my free-time. I went to work as a CNA at OMC's LTAC facility, Lila Doyle where I worked one year before I began my pre-req classes toward my nursing degree at Tech. I had to subsequenly quit my job as a CNA because they wouldn't work around my class schedule. I didn't think that there would ever be an end to all of the classes and studying that I was having to do over the next few years. But it did and finally the day came where I "took the walk" and received my reward for all of my hard work. My nursing degree. I was blessed that my mother got to share that moment in time with me because she had always wanted me to go on to college after graduating from high school. And I did; only 20+ years later! It was the last photograph taken of me and my mom..................I made her proud. And isn't that the greatest joy of any child no matter what their age; to make your parents proud of you? I am blessed to be working in critical care. It was/is the area of nursing that I've been most interested in and fascinated with. My first year as a RN, I worked on a telemetry unit in a small rural hospital before moving into critical care. SO much to learn! But fascinating and intense. It keeps you on your toes. For the most part and the majority of the time I love my job. And there are naturally those times when I don't and wish there was something else that I could do to earn a living at doing. It's those times when I feel as if my heart just can't take seeing and feeling the heartbreak, suffering and loss of patients and their families........I feel as if my heart will burst and there is nothing that I can do "to make it better" for them.....except feel their pain...... But then I think of what an honor it was for me to be there to care for that person in the last moments, days of their lives and my attempt to give comfort to their grieving families. I feel their pain. I recognize it because I have lost my family to disease, death.........it's harrowing pain that slices through to the core of your being.....you never forget it. You never forget it because it brings your own mortality and the fragility of life to the forefront of your concious thinking.....we are here but a brief time..... Life is precious. I'm blessed to be reminded of that fact every day/night that I work in critical care. I can't imagine myself working anyhere else......I'm that friendly though tired smile you see as my patient......I'm a nurse. I always try to keep in mind the thoughts of how I would like to be treated if I had my patient's disease or illness.....it's just that simple and easy. I welcome all new Rn's into the field/profession/career.......you are the future of caring for mankind's health. There isn't any glamour to it, there's a lot of sweat, bruises, tears on this job. You will work the majority of your 12 hour shifts with barely enough time to run to the restroom; forget eating as you've known it.....sharing chocolates with your fellow co-workers though, sometimes gets you past the whole "hungry" thing. You aren't going to get rich either. You will begin to wish that nurse's were really paid what the general public thinks that we earn. That would be a major pay raise across the board for nurses!! You will have to continue to study and read new nursing/medical protocols/procedures or get left behind eventually. Change is a big part of nursing. 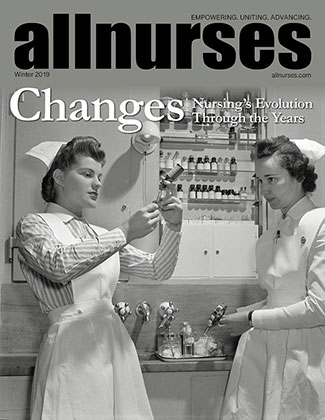 As technologies grow and expand, so will nursing. The ability to adapt is the most important quality of anything that is to survive. Welcome! Why does it always take a major law-suit for hospital administration to 're-think' how they're running the place? Never be ashamed of crying when a patient dies....it only shows that you have a heart and have empathy for the sorrow and loss that the family is enduring. I can't count the times since I've been a RN and working in critical care that I've cried with the family as I hugged them to me.....and then cried again on my way home from work knowing the heartache that they were feeling. And there have been times when I thought that my heart just couldn't take it anymore.....but then, I think of what an honor it was to be there to care for those patients and their families during their last moments in this life.......and I go back into work to do it all again......so, shed those tears when they come into your eyes and heart.....it shows that you have one and that you're human too. Scanning barcodes is an added safety measure to drug administration, but don't kid yourselves....healthcare is a business and business is all about money....scanning med barcodes ALSO insures that the patient is charged for the drug!!! Got No Job? Come be an RN ! You should perform your nursing skills without receiving a pay-check for them.....then, check your "passion" level for it!!! What a saint! This problem of nurse/patient ratios isn't exclusive to one or a few hospitals....it is rampant in the United States. When there has to be a choice between patient safety and making an extra dollar for the hospital, the patient loses out every time. It's all about the bottom line. The only way to attempt to ensure patient safety is federally mandated nurse/patient ratios. No hospital is going to do this of their own accord because it will cost them m-o-n-e-y.....state and federal government will have to force compliance before hospital's will comply. The general public has no idea of how their safety is jeopardized by the "bean counters" in medical facilities. I've noticed that the farther up nurses and doctors go within hospital administration how their view becomes more concerned with making the most money and less about patient safety and care......If the publlic had any idea of how dangerous it is to be a patient in a hospital these days....there would be another 'revolution' in the U.S. And if a nurse or nurses complain about how patient safety is jeopardized with such high nurse/patient ratios, it isn't too long before they're labeled as 'mal-contents' and are soon fired with the proper documentation to back-up the decision for their termination. Is it any wonder that there's a nursing shortage? Patient Safety: We could be the killer! I think the author of this particular article needs to hire a proof-reader......the English and grammar are atrocious! !